Unlike other times when I’ve gone days/weeks without writing, I actually have been running. Friday night we were part of a group run put on by my favorite running store to honor the victims, victors, participants, and what Mr. Rogers called The Helpers (be they spectators and runners who ran towards the danger or the First Responders). We honored them with our run and we celebrated the Strength of Boston afterwards. Saturday morning we ran in a 5K that supports a local “children’s home” (for lack of a better term) that provides intensive in-home treatment, residential treatment, foster care, adoption, transitional living, and crisis services for local area families and youth. It’s a great race (on a hilly course) for an even better cause. For me it marked a PR of special significance: It is the slowest time I have ever logged in a 5K. Some race has to be the Slowest Race. This one had damn well better be mine! If you – like me – run with earbuds in and music playing, please keep the volume at a level that allows you to hear the instructions from the people (in our case Volunteers) working the Finish Line and Finish Chute. Monday the ‘Nother Running Store dedicated their regular Monday Night Running Group’s Run to a community-wide run to honor those in and impacted by The Boston Marathon bombing. We were due to get in a few miles, so there was no reason not to join in that show of support. Besides, we wouldn’t have missed the opportunity for anything. So most of our weekend was dedicated to running. And doing that thing that runners do best: Running for others. 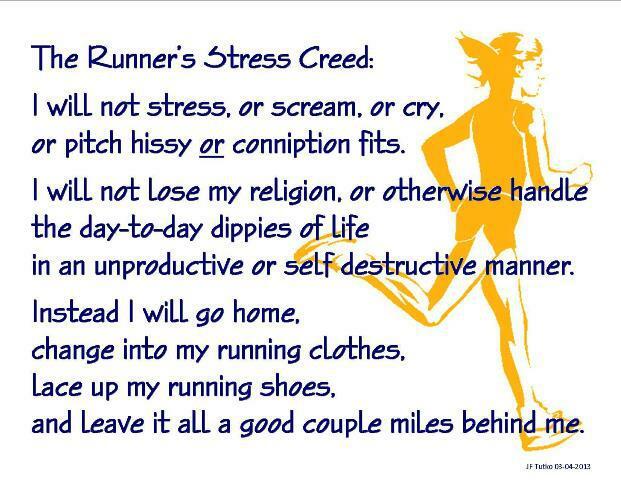 Yet another reason I love running and being a runner. Note To Readers: Both events were largely put on to raise funds on a local level to go to The One Fund to assist victims of the bombing. You, too, can click on that link and make a donation.